Why are tiny tern chicks starving on Maine island refuge? At the Maine Coastal Islands National Wildlife Refuge, the tiny bodies of Arctic tern chicks have piled up. Over the past few years, biologists have counted thousands that starved to death because the herring their parents feed them have vanished. 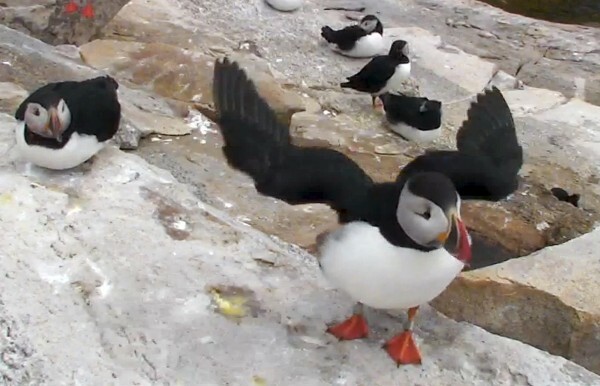 Puffins are also having trouble feeding their chicks, which weigh less than previous broods. When the parents leave the chicks to fend for themselves, the young birds are failing to find food, and hundreds are washing up dead on the Atlantic coast. What’s happening to migratory seabirds? Biologists are worried about a twofold problem: Commercial fishing is reducing their food source, and climate change is causing fish to seek colder waters, according to a bulletin released Tuesday by the U.S. Fish and Wildlife Service. “We’ve seen a 40 percent decline of Arctic terns in the last 10 years,” said Linda Welch, a Fish and Wildlife Service biologist at the refuge. Arctic tern pairs in Maine have fallen from 4,224 pairs in 2008 to 2,467 pairs last year, the Fish and Wildlife Service said. Biologists at the Maine refuge are not sure whether herring sought colder waters elsewhere or went deeper, but they are no longer on the surface where Arctic terns pluck them. While other birds can dive deep for food, Arctic terns cannot. On the Machias Seal Island, the largest tern colony on the refuge’s 50 islands, a shortage of fish prompted 3,000 pairs to abandon their nests in 2007. “They haven’t raised any chicks since,” Welch said. In the last two years, Welch said biologists at the refuge went to the most productive foraging grounds where seabirds, whales and dolphin prey on herring and spotted fishing trawlers. Recently the Mid-Atlantic Fishery Management Council lowered the amount of herring and shad that trawlers can take next year in an effort to save the species. The effect on seabirds was not a prominent factor in that decision. Climate change also threatens a shorebird, the red knot. As temperatures warm, they are leaving the southern tip of Brazil later for a 9,000-mile journey back to their Arctic breeding ground. Timing is key, because red knots might miss the peak of Delaware’s horseshoe crab spawn, where they gorge themselves on eggs and double their weight. Past events foreshadow the fate of red knots that fail to eat enough horseshoe crab eggs before the long trip north. For years in the 1990s, horseshoe crabs were overfished as bait for shellfish. As the horseshoe crab went, so went the red knot. By 2000, a population of about 100,000 had fallen to about 44,000, a stunning decrease, said Gregory Breese, a supervisory fish and wildlife biologist for the Delaware Bay Estuary Project office. Estimates based on other counts vary but still show a major decline. For the Arctic tern, the future is just as cloudy in an era of climate change. Fish and other sea life that crave colder water have been swimming to the Earth’s poles, abandoning areas like the warming Gulf of Maine. In research published in the journal Nature, University of British Columbia scientists found that 968 species of fish and invertebrates they studied fled from the warming waters of their original habitats. Male and female terns are thought to pair and mate for life. The females generally lay two eggs. When they hatch after 21 days, the parents search for food to feed their chicks 14 hours a day. The primary food is herring. It is not known how puffins get to Maine; living out at sea makes them hard to study. But, like terns, they dine on herring. And when they cannot find herring, they bring their chicks the larger butterfish. Numbers of puffin pairs have increased slightly in recent years, Welch said, but their chicks are smaller and weigh less than before. “What will happen in five years when they come back” mature and ready to mate, she wondered. If they make it back at all.